It's a new day that is yet again, FULL of giveaways! So are you ready for the first giveaway of the day? It comes from the fabulous Alison from aPearantly Sew. 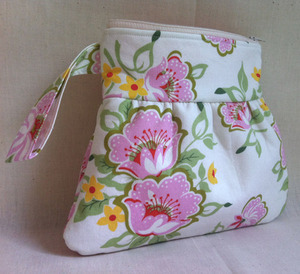 Alison sews some lovely purses, clutches and other small bags. I have one of her clutches and I love it. It is made so well and it is small enough to take out places without having a big purse in the way. Alison is giving the lucky winner $20 Shop Credit so you can purchase anything from her shop. Here are some fun items from her shop to get your mind racing. Here's how to win the $20 shop credit. 1.) MANDATORY: Visit aPearantly Sew and come back letting me know what you would buy with the shop credit. 3.) Follow Alison on Twitter. 5.) Post the Celebration button (code in top, left sidebar) on your blog. Leave me a link. The next giveaway will be up at Noon! I love the on the go art case for boys! hooty hoot! Not sure if my first comment went through... If not, I like the nautical wristlet clutch. So cute! I follow Alison on twitter! 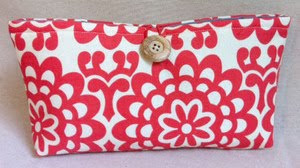 I would choose Diaper/Wipes Case in the red floral for my prego sister in law! She'd love the print! I love the nautical wristlet clutch! I'm following her blog now!! Love the red floral clutch! And I follow A Glimpse Inside! I love the lindsay clutch! Love the Lindsay clutch!! Would have to decide between the two colors with the dots!! I would get the diaper and wipes case in pears. Cute! I follow AGI on Blogger. I have your celebration button on my blog home page. 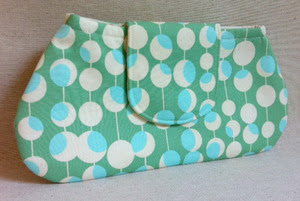 I really like the Lindsey clutch in yellow dots. Thanks! i would buy the Pink & Yellow Clutch. I'd probably change my mind at the last minute, cause I'm a girl and it's my right, but I LOVE the blue and nautical one the most! I'd buy the Diaper/Wipes case in red floral... so cute! Love the Lindsay clutch in yellow dots! Hi there! I'm new here :-) I LOVE Alison's shop! I would pick the retro zippered pouch. I would get the nautical wristlet clutch. I love the startburst clutch! The spring bouquet wristlet clutch! Oh! I really like that one. It would be perfect for my trip I'm going on! Following Alison's Blog aPearantly Sew! 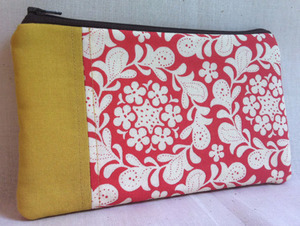 Kinda lovin' the red floral clutch! I'm already a follower of "A Glimpse Inside"
Now following her on Twitter!! I LOVE her reversible sling tote in "honeycomb"...so cute!! I really really love all the little purses in this shop.. but I am a complete sucker for pretty bunting so my fave item is definatly the personalised banner.. I'd pick the diaper/wipes case in the Fall Fruits. What a fun fabric! Thanks for hosting this giveaway! I would get the spring bouquet wristlet clutch. So pretty! I love the Spring Bouquet Clutch! I would pick the pink and yellow clutch! I would pick the diaper/wipes case in orange and cream! I love the diapers/ wipes cases in red floral and polka dot red! I love the personalized banners! so sweet! Love the lindsay clutch! Thanks for the giveaway! I like the Tiny Leaves Clutch! I really like the pink and yellow clutch! I love a handful of the zipper pouches, so pretty!! Either the "Tiny leaf Clutch" or the "Lindsay Clutch". OMGosh! They are so freakin cute!! Hmm, I 'd either go for the revserible bag or the diaper case in fall fruit. love that print. I would get one of her Lindsay clutches... undecided on which one because they're all so stinkin' cute. I like her Reversible Sling Tote in Honeycomb. I'd buy the lavender & pink Lindsay Clutch! I'm a new follower of aPearantly Sew! I follow "A Glimpse Inside"! I love the Fall Fruits diaper/wipes case! Too cute! A cute diaper wipe case. :) Darling! I am following Alison with aPearantly Sew on Twitter!